Science Days is a milestone event that presents an opportunity to educate and bring awareness to thousands of young students and educators on the significance of STEM and the aerospace industry and its impact on Global’s economy. The aerospace industry represents billions of dollars in annual economic impact and employs millions of people around the world. From March 12 to April 7, 2019, Science Days will be presented in several regions in Brazil. Private companies, local, state and federal agencies, and academic institutions will participate in this unique, annual event, meant to educate our future leaders on the challenges and opportunities Brazil has during this dynamic time in the space program. 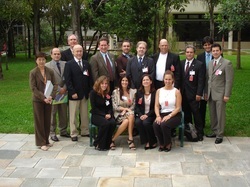 ​The Brazil-Florida Chamber of Commerce, is pleased to announce the fifth joint study tour and an outbound mission to Brazil, a certified Brazilian American event sponsored by Florida International Business School, to the cities of São Paulo, Campinas (including Campinas Region), Rio de Janeiro, São Jose dos Campos, Jundiai and Sorocaba in 2018 and 2019. The goal is to expand ties between Florida companies and Brazil -- already our largest trading partner. The state of São Paulo is probably the most recognized business center in Brazil with around 36.2% of the country's industrial production. The city of São Paulo is one of the largest metropolitan areas in the world and accounts for half of the GDP of the state, and 12% of the nation. Brazil offers unprecedented market opportunities for Florida to expand trade and create jobs for Floridians. Brazil is Florida’s No. 1 trade market valued at nearly $14.7 billion in 2016 and its anticipated growth provides excellent future opportunities for Florida companies. Certain sectors of the Brazilian market have experienced higher than average growth, such as air transportation, telecoms, oil and gas, and mining. Under the second phase of the Growth Acceleration Program (PAC II), the Government of Brazil will spend approximately $470 billion on infrastructure development, including an energy generation and distribution system, roads, railroads, ports, airports and stadiums, as it prepares for the Olympic Summer Games in 2016. As one of the largest IT markets among the emerging nations, IT end-user spending in Brazil is expected to grow to $134 billion in 2014. Telecom equipment will receive the largest share of spending, representing 72 percent of the market, followed by IT services at 13.3 percent and computing hardware at 11.9 percent. TechXpo, referred to as "tech-spo," is an exposition of the technology and innovations created by 100 technology and manufacturing companies throughout Florida. The Melbourne Regional Chamber of East Central Florida is proud to present the 3rd annual Florida TechXpo. This single-day event allows companies with advanced Technologies and innovations to display their products and services to other companies looking for resources and suppliers. TechXpo also celebrates Manufacturing Day October 4th, which highlights the importance of manufacturing to the nation's economy and draws attention to high-skill jobs available in manufacturing fields. To continue the momentum of this manufacturing celebration, Florida TechXpo 2014 will showcase hot industries, including Aerospace, Composites, Consumer Products, Emerging Technology, Homeland Security & Defense, Health Care, Information Technology, Manufacturing, Robotics, Simulation, Telecommunications, & Transportation. "Be a Part of Florida's Energy Economy - It's Broader than You Think!" The Brazil- Florida Chamber of Commerce in cooperation with Space Coast Energy Consortium is proud to present exciting opportunities in Energy development. During the Symposium companies will present ideas and projects reflecting real demand for necessary infrastructure growth and offer tangible opportunities for International participation and alliances. There is enormous, real, energy related projects demand globally – not just pent-up demand from the crisis years, but new projects and project clusters reflecting individual country strategies to seize globalization’s opportunities. Hospitalar is the most important health fair in Brazil and Latin America. The show features products ranging from the most sophisticated stateof-the-art medical technology to disposables. Almost 90,000 professional visitors and over 1,250 exhibitors are anticipated at this year’s show. HOSPITALAR 2014 attracted over 89,000 visitors from 54 nations, including 1,500 foreign buyers. Eighty percent of these visitors were from other South American countries. They came from 11 Brazilian states, representing 745 municipalities. Distributors/representatives and hospitals (clinical directors) continue to be the largest group of professional visitors. Brazil is the largest economy in South America with the highest potential in the healthcare market. Brazil has over 6,400 hospitals and 15,000 clinics and healthcare establishments. The Brazilian healthcare market is over $125 billion. Imports account for approximately 25% of the market, with the U.S. providing 50% of all imports. The medical equipment market is over $6.0 billion. The continued expansion of the Brazilian private health care sector, particularly in the HMO sector, should create new opportunities for U.S. exporters, particularly for more advanced medical equipment, disposables, diagnostic devices, implants and components. Brazil’s economy is vibrant. U.S. exports to Brazil grew to US $42.9 billion in 2014.